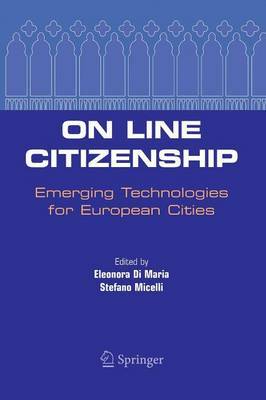 On Line Citizenship discusses the evolutionary trends of cities in terms of e-government in the present and future technological scenario. The focus is on the transformation of the relationships between city administrations and citizens due to Information and Communication Technology. On a broad perspective, the book intends to present opportunities and threats in the development of on line citizenship in the framework of the European Union. On Line Citizenship gathers original contributions and documents presented at the International Conference On Line Citizenship - Emerging Technologies for European Cities promoted by Telecities-Eurocities and the City of Venice in co-operation with Venice International University and sponsored by SUN Microsystems, held in Venice, May 30-31, 2003. The work is complemented by multimedia presentations and speeches from the conference, available at http://it.sun.com/eventi/online_citizenship (reserved area).